Alberto Cova, the athlete who won the 10,000 metres gold medal at the 1984 Olympics, was born on this day in 1958 in Inverigo, a small town not far from Lake Como and a little under 40km north of Milan. 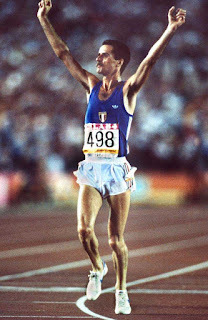 Cova's triumph at the 1984 Los Angeles Games completed a golden hat-trick of 10,000m titles, following on from his gold medals over the distance at the 1982 European Championships in Athens and the 1983 World Championships in Helsinki. He was not able to maintain that form, however. 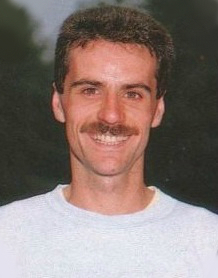 He was run out of the gold on the final lap of the 10,000m by fellow Italian Stefano Mai at the European Championships in Stuttgart in 1986 and failed to qualify for the final at the Seoul Olympics in 1988, which proved to be his last international competition. Cova's chief asset was his devastating sprint finish, which could be nullified in a race run at a strong pace throughout but often was not. He was an outsider when he sprang a surprise in Athens in 1982, when his finishing speed enabled him to charge through to beat the favourite, Werner Schildhauer from East Germany, to win his first international championship title. His disciplined running style enabled him to triumph again in Helsinki the following year, when the pace was slow and 13 runners were still in a leading pack at the bell. With only 30m left, Cova was in fifth place, but then found the energy to sprint for the line, passing all four runners in front of him and relegating Schildhauer into second place again. Cova found the field playing into his hands again in Los Angeles. The final began at an even slower pace than at Helsinki. With 4km to go, Finland's Martti Vainio began to accelerate but Cova stayed with him and Vainio could not maintain the quicker pace and Cova swept past him after the bell. Vainio was subsequently stripped of his silver medal after traces of an anabolic steroid were found in a urine sample. A qualified accountant, Cova combined his athletics with his office job. He was nicknamed 'the accountant' in part because of his profession but also because of the meticulous way he kept to his racing plans and stayed faithful to his tactics. Cova won 14 Italian titles, including five cross-country championships, four over 5,000m and two at 10,000m, and attributes his success to his work with the top Italian coach, Giorgio Rondelli, at the Pro Patria athletics club in Milan. His successes were tarnished somewhat when, in the wake of revelations of organised blood doping by the Italian federation, Cova confessed he had used the process by which the oxygen-carrying capacity of the blood is increased by the withdrawal and re-infusion of red blood cells. Blood doping, or blood boosting, can improve performances by 5 per cent. Yet Cova was never punished. After his athletics career, Cova became involved in politics and was elected to the Chamber of Deputies of the Italian Parliament in 1994 after winning the Olgiate Comasco seat in Lombardy for Silvio Berlusconi's Forza Italia party. Two years later he ran again for the town of Erba but was defeated this time by the Northern League candidate, Cesare Rizzi. Nowadays, Cova works as a commentator on athletics events for Italian television. Inverigo falls into the area of Lombardy known as Brianza, which extends from Monza, just north of Milan, to the triangle of mountainous land that sits between the forks at the southern end of Lake Como. Brianza is best defined as a cultural, geographical and cultural region, first settled in the second millenium BC. 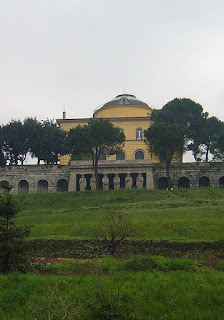 Inverigo's most interesting building is the Villa Rotonda, a castle built in the early part of the 19th century to a design by Luigi Cagnola inspired by Andrea Palladio's Villa Capra near Vicenza, also commonly known as La Rotonda. Erba, the town for which Alberto Cova stood and lost during his career as a politician representing the Forza Italia party, is situated about 10km (six miles) east of Como at the foot of the mountainous area known as the Lombard Prealps. Its Romanesque church of Sant' Eufemia has an eye-catching 11th century bell tower and there are the remains of a medieval castle.